Since I was marathon ready and in a running mood, I decided to go ahead and sign up for another marathon. 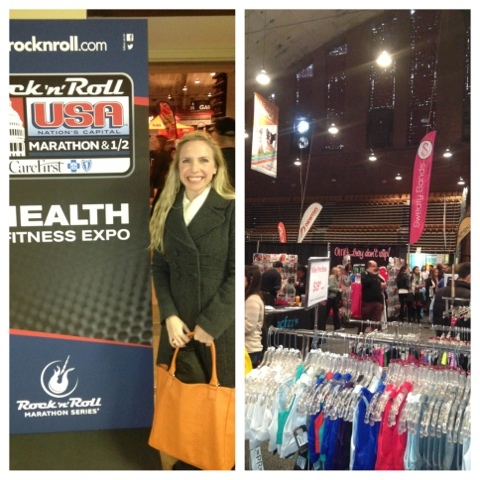 Thus I picked one that was close to home...the Rock N Roll USA Marathon right here in DC. What I didn't take into account was how much I love to train in the Fall (perfect timing for the November NYC marathon), but I HATE to train in the Winter (bad for a March marathon). Therefore, from December till Race Day I essentially only ran about 15 miles total in training. I did CrossFit regularly but my longest "long run" was approximately 5 miles. Cold weather and starting a new job did not provide good training conditions. 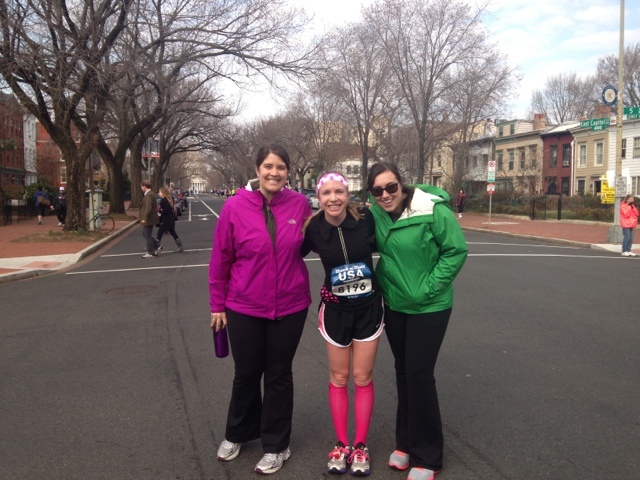 Despite my lack of running training, I knew I wanted to run the race no matter what. 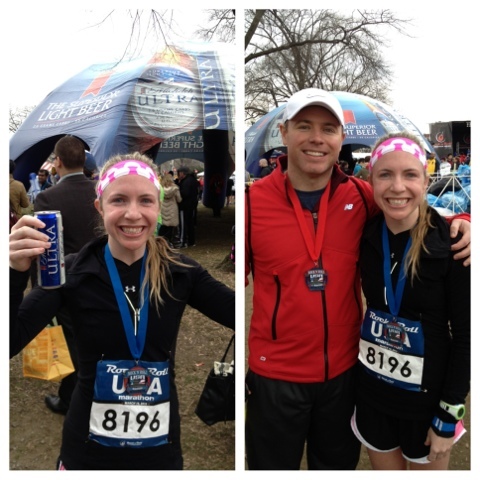 I didn't want to lose my money, plus I wanted to get another marathon under my belt. I knew my goal of a sub 4:00 hour was definitely not going to happen this time around, but my overall goal was to have fun and be able to walk the following day. On Friday night, the night before the race, Josh and I went to Expo to pick up our bibs and shop around. There was a decent amount of vendors. The weather report was reporting that race day was going to be cold, rainy, and windy...definitely not my ideal conditions. Josh purchased an all weather jacket, and I got two new head bands and we headed home to fuel up on some pasta. After dinner, I sorted through all of my goodies from my Swag Bag. They had the usual goods, but one fun surprise was coupon to Tortilla Coast, a restaurant right by my office. Definitely looking forward to using that after Lent!!! 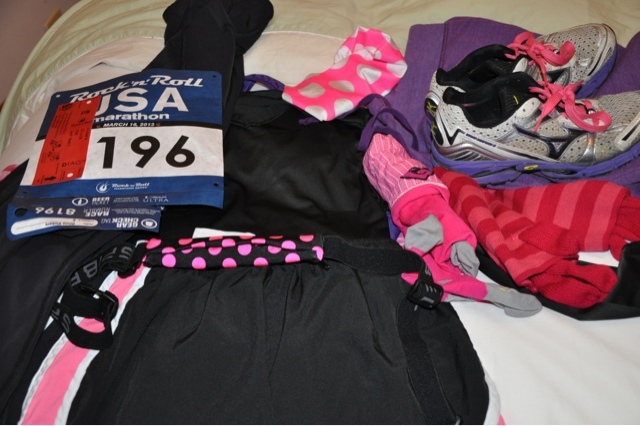 I also laid out all of my clothes for the next day, my new head band, my bibb, and throw away clothes! Even though I recently purchased new shoes I decided to use my old Mizunos for one last run! Thanks Old Girls! The next morning at 5:30am, Josh and I woke up for the big race. 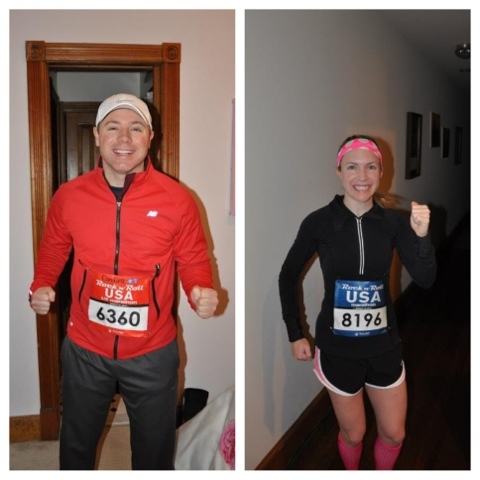 He had signed up for the half-marathon, and I was so thankful to have a race day buddy! After a breakfast of a 1/3 of a banana and a blueberry bagel, we got dressed and made our way to the metro! It was so great to be so close to the start, and the entire metro was full of runners. 30,000 people had signed up for the half/full marathons, and you could tell. There were lines EVERYWHERE. I had to go to the bathroom and waited in line for over an hour for a port-a-potty. Josh also had to wait in line for the bag drop. These long lines made us miss the official start and we ended up in corrals that were much slower than our pace times. Josh and I finally got started on the run at about 8:30am, approximately an hour after the official start. It was sooooo crowded in our corral that our first mile took 11 minutes. Pretty slow. 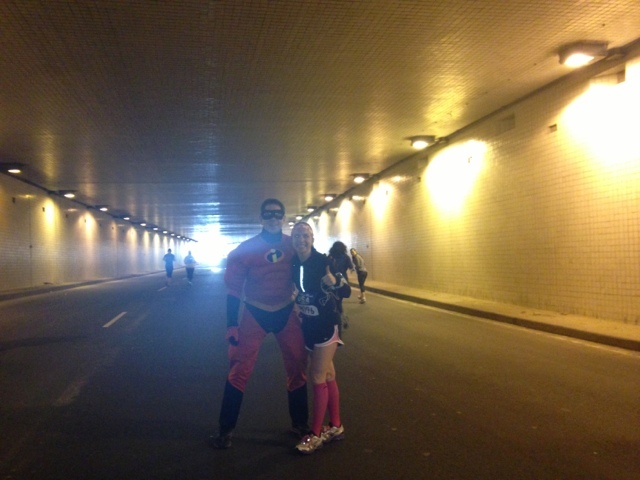 However, I loved running with him, and the energy and crowd support was amazing. The Half and Full ran together for the first 12 miles, and it stayed incredibly congested the entire time. This was not the race for setting a PR or getting a comfortable pace. 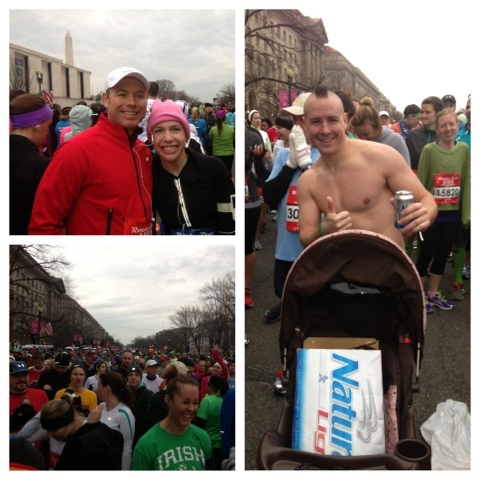 It was the race for a fun time and to see a lot of DC. I ran by parts of DC I have never even been to, and I loved running by all the row houses with their inhabitants having parties in the front yard! 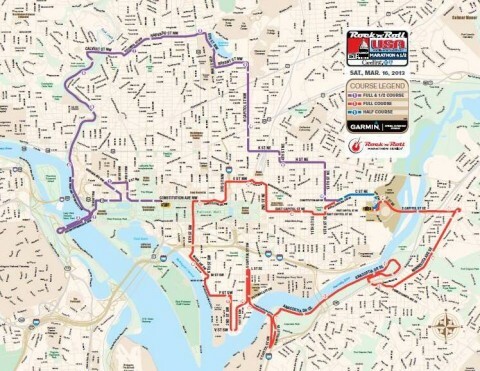 Miles 1-12 took us through most of the NW part of DC which is rather hilly. Josh and I stayed together until about mile 8, but then he left me in his dust. It was at this time that I knew I needed to take it pretty easy in order to survive this race. The purple is the part was the first 12 miles of the race with the half marathon runners, and the red is where we split off for the rest of the race. During races, there are always times when I get emotional. I cry because I am happy to be a runner, thankful that I can participate in the event, and grateful for all of my blessings. Running really brings out all of my feelings. I also get tearful when I am in pain, and that is also when I think to myself why the hell did I sign up for one of these again. The happy and thankful tears came at about mile 7. This is when Josh and I both noticed a Marathon runner that was running with one leg. He was using crutches to help him navigate the course. I admired his strength and determination so much, and cheered him on as he beat me up a monster hill in Adams Morgan. The feelings of regret came at about mile 12 right when the marathoners split from the half participants. I had just gotten a major side stitch (which always seems to happen at this point of a marathon race for me) and was jealous of all of those halfers that were heading to the finish and the beer tent. Luckily for me at mile 13 was when I knew I would see two of my dear friends, and know they would be there got me over that negative hump! While visiting with Beth and Meghan, I had some of my Jelly Belly sports Beans and then headed on my way. Seeing them totally rejuvinated me and I was ready for the second part of the race! I would guess that 80% of the race participants ran the half, because after the split the course FINALLY opened up. This helped me get in my groove a bit better. At Mile 16, I finally turned on my IPod. I have gotten much better about running without music, and now I try to only use it when I am dragging. This was also when I started walking through all of the water stations. I was much thirsty by this point because the bad weather had held off and I was getting hot! When I finally saw RFK stadium, and the finish line, I was so thankful. I knew I had ran a lot slower than my last marathon, but I didn't care. I was so proud that I had finished and powered through the race. This is another moment when the tears of joy come a flowing! My handsome man was waiting for me at the end of the race, and we celebrated both of our finishes at the beer tent! My official time for this race was 4:45:25 about 40 minutes slower than my previous time. However, I feel very proud of this time. Like I said before, I did not train at all and I just wanted to finish the race injury free. I think going slower and wearing my compression socks helped make this happen. I love my compression socks and could talk about them for hours. 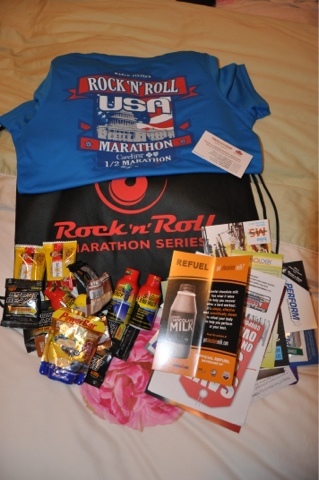 All in all I had fun and am happy I ran the Rock N Roll Marathon, but I am not sure I would ever run it again. It was just too crowded. There were not enough port-a-potties and volunteers. At several water stations I ended up getting my own water...totally fine...I don't mind at all, but just prepare me and then I would have worn my fuel belt. Crazy enough I think my experience at the small (only 100 people) McAllen Marathon was better. I liked that I was never crowded and blocked in, and it really helped me set a great pace and reach my time goal. I will remember this when I pick my next race where my goal is to run a sub 4:00 hour. I need a smaller race like McAllen with the energy of the Rock N Roll series. Are you running a race soon? I am going to take a break from racing for a bit, but if I see something that strikes my fancy I will sign up! Do you like smaller races or larger races?